In this article we will learn about the measurement of solar radiation. We will also study about following devices which is used to measure the solar radiation. We will know about the working of pyranometer and pyrheliometer. It is important to measure solar radiation, owing to the increasing number of solar heating and cooling applications, and the necessity for accurate solar radiation data to predict performance. 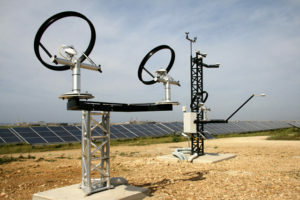 These are some devices which is used to measurement of solar radiation. 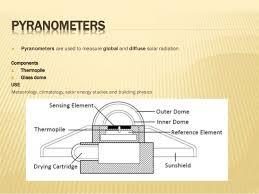 A Pyranometer is a device use to measure the “total hemispherical solar radiation”. The total solar radiation arriving at the outer edge of the atmosphere is called the “|Solar constant”. The working principle of this instrument is that sensitive surface is exposed to total (beam, diffuse and reflected from the earth and surrounding) radiations. It consists of black surface which receives the beam as well diffuse radiations which rises het. A Glass some prevents the loss of radiation received by the black surface. A thermocouple is a temperature sensor, and consists of a number of thermocouples connected in series to increase the sensitivity. The supporting stand keeps the black surface in a proper position. When the pyronometer is exposed to sun, it starts receiving the radiations. As a result, the surface temperature starts rising due to absorption of the radiation. The increase in the temperature of the absorbing surface is detected by the thermopile. The thermopile generates a thermo emf which is proportional to the radiations absorbed. This will measure global solar radiations. 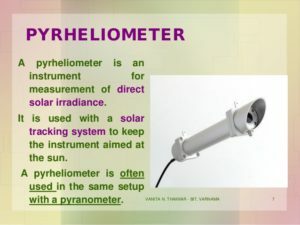 A pyrhelimeter is a device used to measure beam or direct radiations. It is collimates the radiation to determine the beam intensity as a function of incident angle.This instrument uses a collimated detector for measuring solar radiation from the sun and from a small portion of the sky around the sun at normal incidence. In this instrument, two identical blackened magnin strips A and B are arranged in such a way that either can be exposed to radiation the base of collimating tubes by moving a reversible shutter. One strip is placed in radiation and a current is passed through the shaded strip to heat it to the same temperature as the exposed strip. When there is no difference in temperature, the electrical energy supplied to shade strip must equal the solar radiation absorbed by the exposed strip. Solar radiation is then determined by equating the electrical energy to the product of incident solar radiation, strip area and absorptance. these are use in measurement of solar radiation. 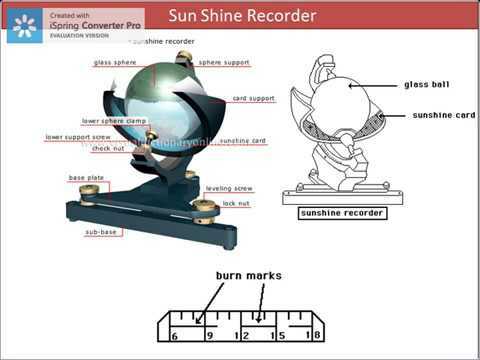 A sunshine recorder is a device used to measure the hours of bright sunshine in a day. It consists of a “glass-sphere” installed in a section of “spherical metal bowl” having grooves for holding a “recorder card strip” and the glass sphere. The glass sphere, which acts as a convex lane, focuses the sun’s rays/beams to a point on the card strip held in a groove in the spherical bowl mounted concentrically with the sphere. Whenever there is a bright sunshine, the image formed is intense enough to burn a spot on the card strip. Through the day, the sun moves across the sky, the image moves along the strip. Thus a burnt space whose length is proportional to the duration of sunshine is obtained on the strip. Hence these are method measurement of Solar Radiation. We have studied about the sunshine recorder working and construction. We have also know about Pyrheliometer Working and construction and know that how it measure of solar radiation. If you will find any incorrect in above article you must comment below in comment box.